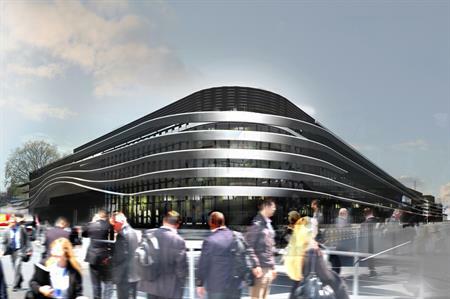 Farnborough International has unveiled details of the Farnborough International Exhibition & Conference Centre, scheduled to open in 2018. Farnborough, home to one of the world's most famous air shows, has seen its new conference centre designed to reflect this. The look and feel of the structure draws heavily on Farnborough’s association with aircraft testing and development in its wind tunnels, as well as reflecting the modern-day look of local buildings such as the neighbouring Aviator hotel. When complete, the new purpose-built event space will be flexible enough to cater for any kind of exhibition, conference, meeting, dinner or launch event and will include 12,500sqm of exhibition space, 2,500 conference seats and 14 multi-purpose function rooms. The unveiling follows the successful securing of £30m in funding for the project and the recent appointment of Michael Watton as Farnborough International’s new venue director earlier this year. Watton said: "This part of the country has long been crying out for a large purpose-built event space with easy access to London, Gatwick and Heathrow. The flexibility and scale of our existing and new event space will make Farnborough attractive to any event organiser, whether it’s a membership-based conference with exhibition space or a major exhibition with a requirement for seminar or workshop space. "With 2,500 hotel rooms now within a 15-minute drive, Farnborough will be incredibly well placed to host regional, national and international events delivered with Airshow quality and a committed team."